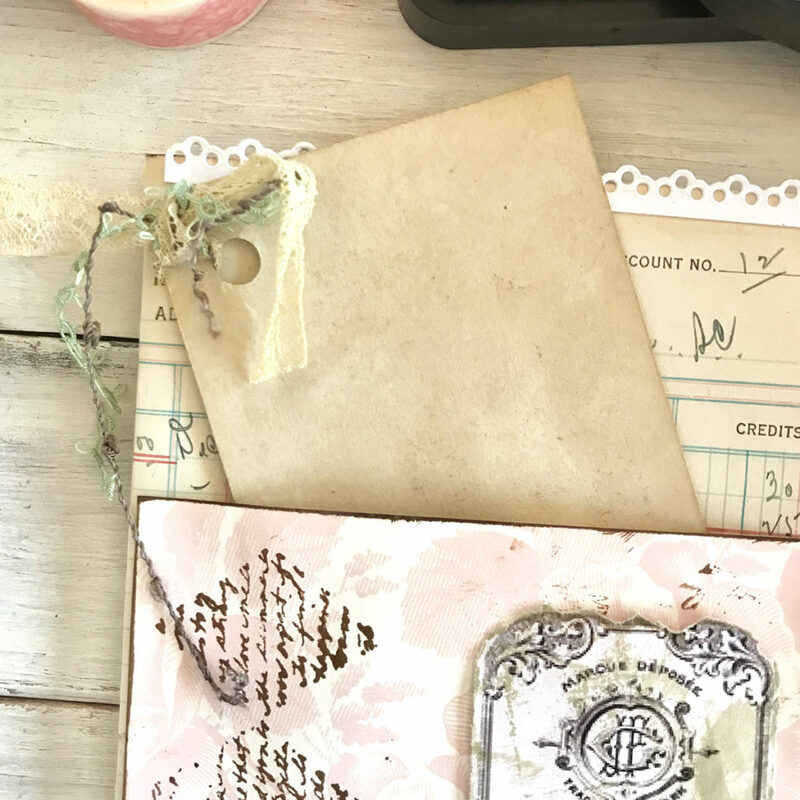 We’re back with our continuing “How to Make a Junk Journal” series. We have arrived in Paris!! C’est magnifique!! 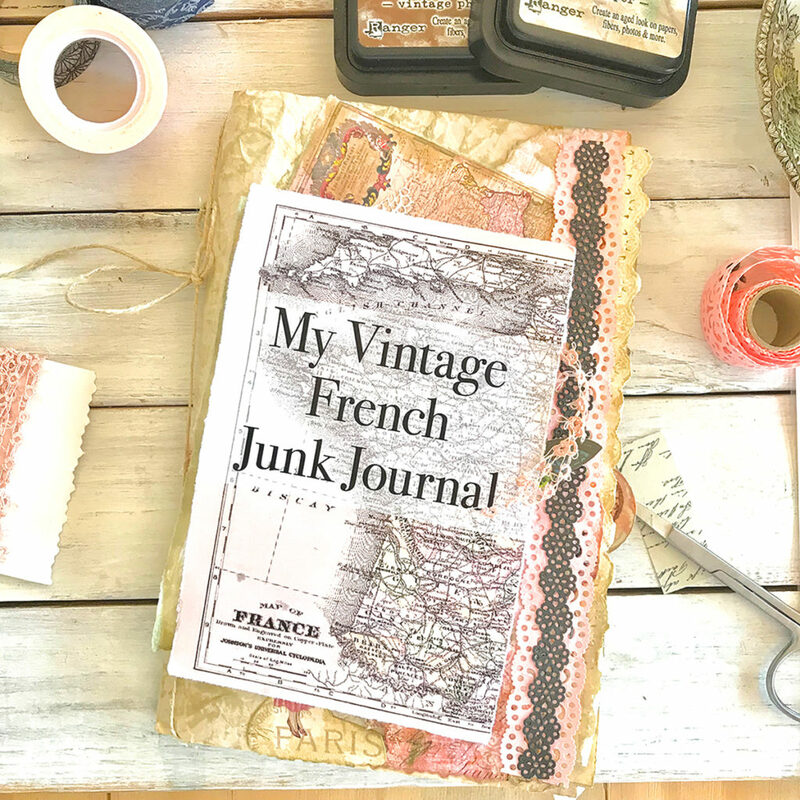 Our ‘Vintage French Junk Journal’ (JJ3) journey continues with new page layouts and easy, fun techniques. 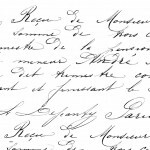 We will be creating the final eight pages of our first signature in this tutorial. Think pockets! If you missed the first two tutorials in this series, I recommend that you work through them before attempting this tutorial. You can find the first one here –>>> The Junk Journal Introductory Tutorial and the second here –>>>Page Layouts 1. One of the lessons I have learned so far is to approach the pages with a Joie de vivre (French pronunciation: ​[ʒwa də vivʁ], joy of living) relaxed, serendipitous attitude. I do not worry so much…each layer can be changed, altered, built up, stripped back, gessoed, and added to as much as I like. 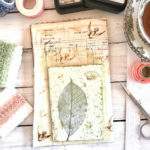 We are simply exploring the unique world of lost and found; creating pages to discover paper/textile layering and pasting techniques while we tear, cut, stamp, stencil, reconstruct, and stitch our way to a new mixed media artwork on every page. Each page is reflecting the narrative with formal and/or abstract qualities. How cool is that? 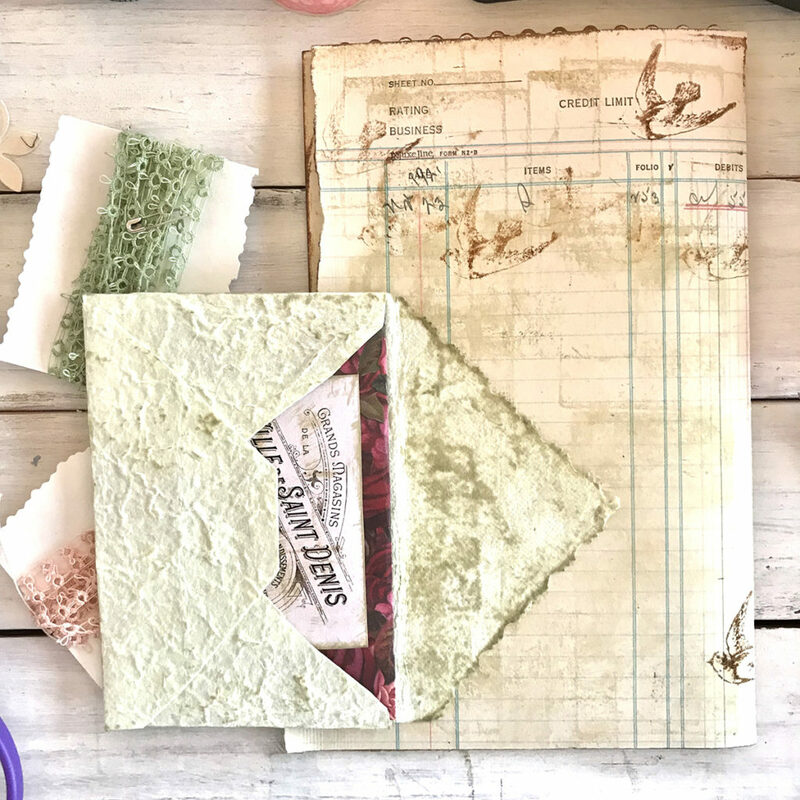 For this tutorial we will be using the Basic Supplies from our How to Make a Junk Journal Page Layouts 1, plus found objects from our kitchen and stash. I use Distress Ink Old Paper for aging pages and edges of almost everything. When I want more contrast I use Distress Ink Vintage Photo. 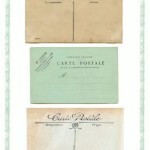 Plus this collage sheet of French postage items. Pockets and secret places is the theme for this tutorial. One of my favorite things to do is create unexpected ‘hidey-holes’ or nooks and crannies used as a hiding place for treasures. 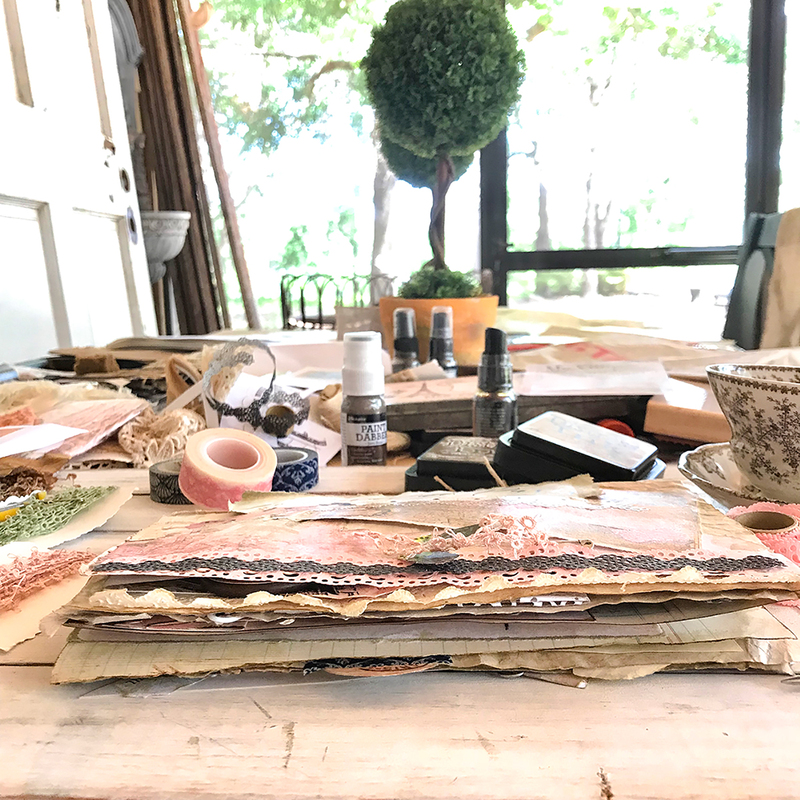 For these pages, we are going to make a variety of pockets, a journal within a journal (small travel journal), and assemble a postcard from two images. We will also learn another way of tearing the edges of our images to create a deckle. 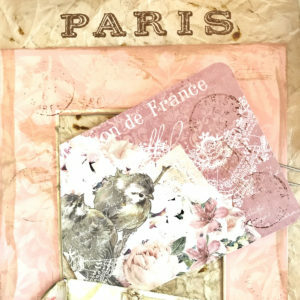 Our first page is pretty much cut and paste using the inspiration Pink Map of France, along with a typeset ‘journal de Paris’ I created on my computer, stickers, paper from my stash, and some lace edging and ribbon. There’s nothing too fancy, yet it sets the tone of the entire book. Create yours with thoughtfulness. 🙂 Please feel free to use a different map that suits your style more closely. Anything goes in this series. I simply adore this tiny book within a book. I always have one of these in my pocket when I travel. 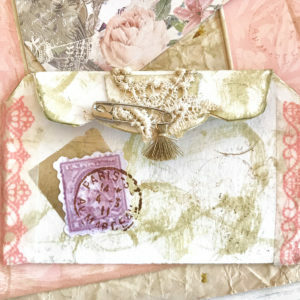 It is perfect to hold little found objects like feathers, stickers, tags, leaves, stamps, paper scraps, etc. I also make notes or sketch on some pages so I don’t forget a precious moment. 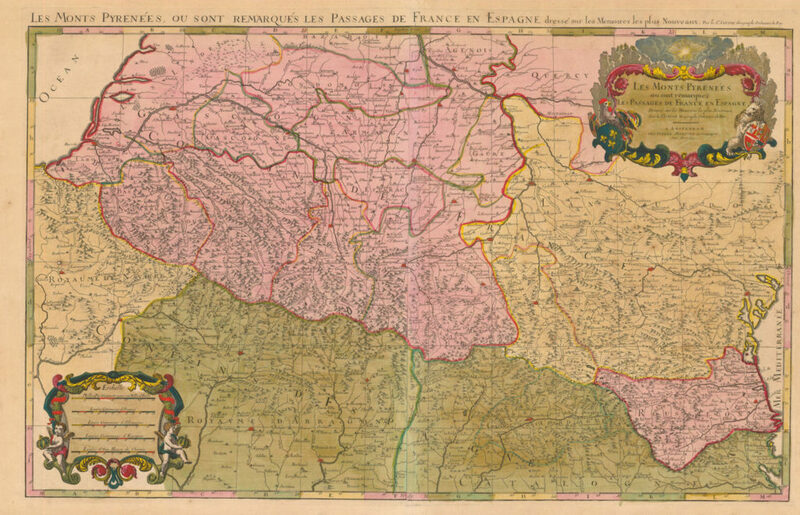 This one takes less than 10 minutes to make using the Instant Art Printable Map of France. After you trim the edges, simply fold the map in half across the shortest side. Then fold it into three equal sections as you can see in the middle image below. Wrap the right page over the top as in the photo on right. When open, you can see the structure of the book. The left fold holds tiny pages made from scrap paper. I ages the edges of the map cover as you can see in the first image of this technique. I don’t bother to age the insert sheets, but feel free to do so if you like. 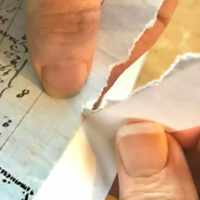 Cut pages to fit inside the map cover. Create little pockets as shown below. I make vertical and horizontal pockets. (Left) The structure is held together with an elastic pony tail band. (Middle) I can easily remove pages as I fill them and replace with others. 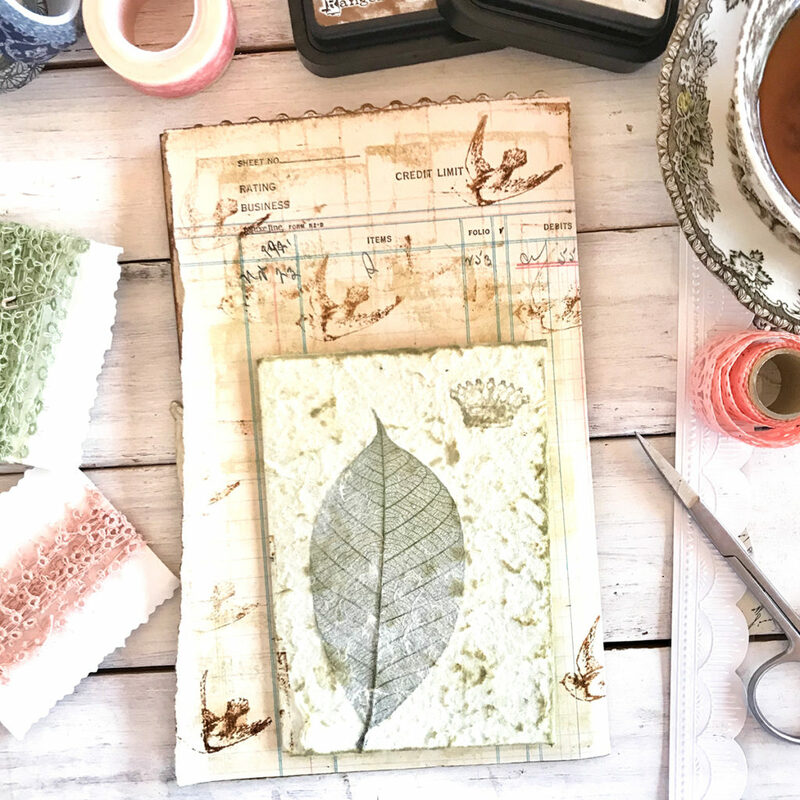 You can create a travel journal of any size with this technique. I like this size because it fits in my pocket. I make several pre-cut pages to take with me in a zip sandwich bag. It fits easily in my luggage or purse. I place the completed pages into the same baggie for safekeeping. It’s so very handy to take the baggie into the art room when I return home. TIP: I have been known to use the little phone notepad in my hotel to create pages for my travel journal. I just take it with me to breakfast and use the butter knife method to create pages while I wait for my food to be served. 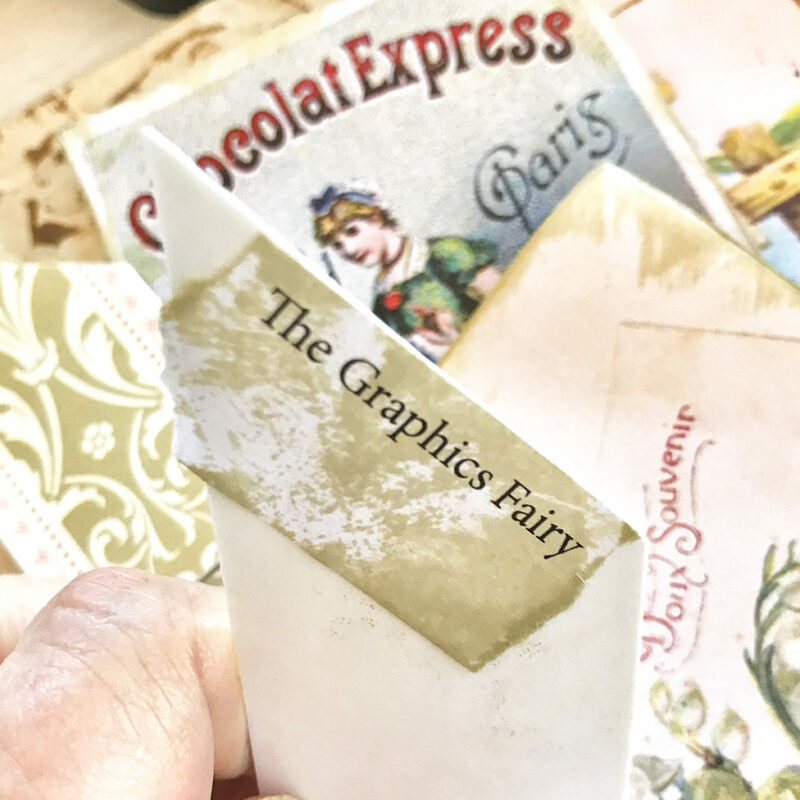 😉 In our junk journal, the book is tucked into a pocket created from a post card image. 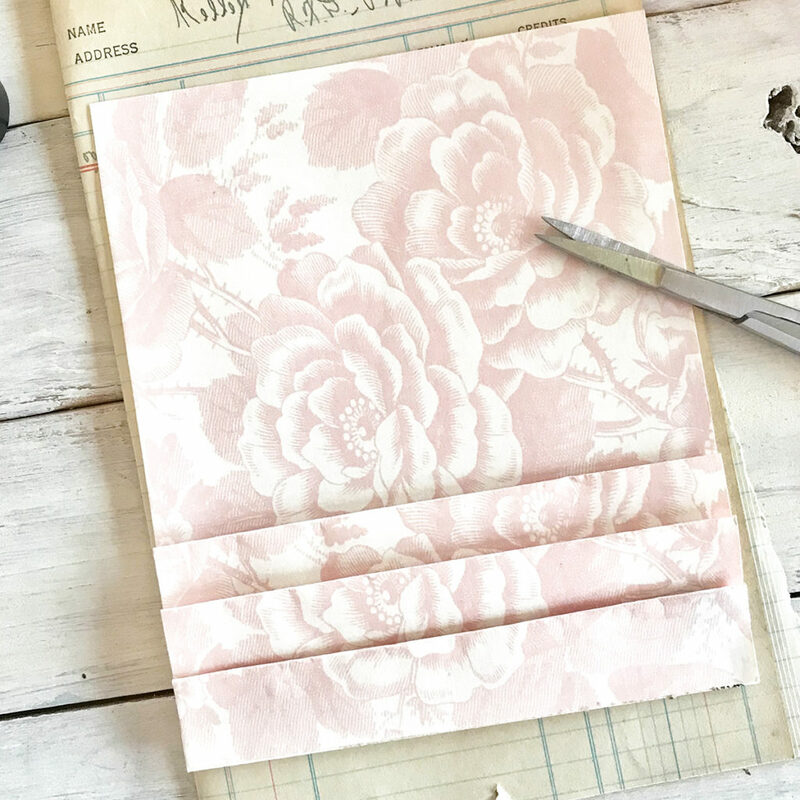 This is another fave way of tearing papers so they have a beautiful deckle edge. Simply fold along the cut line (left), slip a butter knife into the crease, and pull toward the crease (middle). This creates a beautiful deckle edge (right and below). For heavier weight papers and card stock, I wet the crease before tearing. Easy peasy! This is a fun way to display ‘littles’ or small bits of memorabilia. 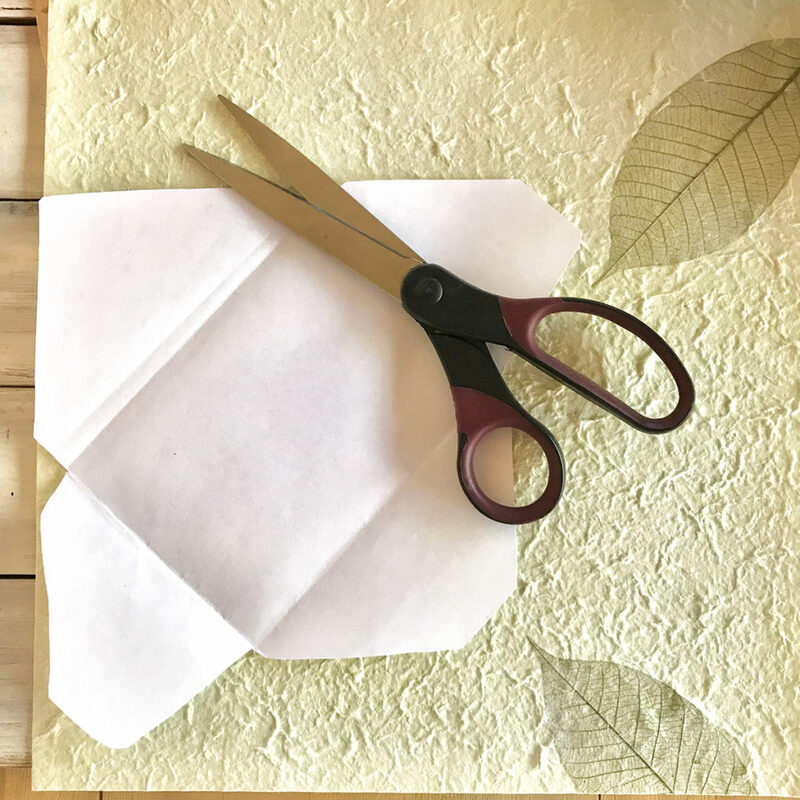 Trim a piece of 12″ scrapbook paper a little smaller than the width of the journal page. Then fold three pockets at the bottom accordion style, leaving each a little shorter from back to front. Mine are about 1″ deep, although you can make them deeper. 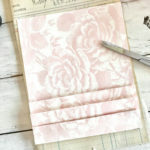 Burnish the edges with a bone folder or the handle of your scissors. I leave the edges open so the back pocket can drop down for journaling. I decorated the back with a harlequin stamp of handwriting. 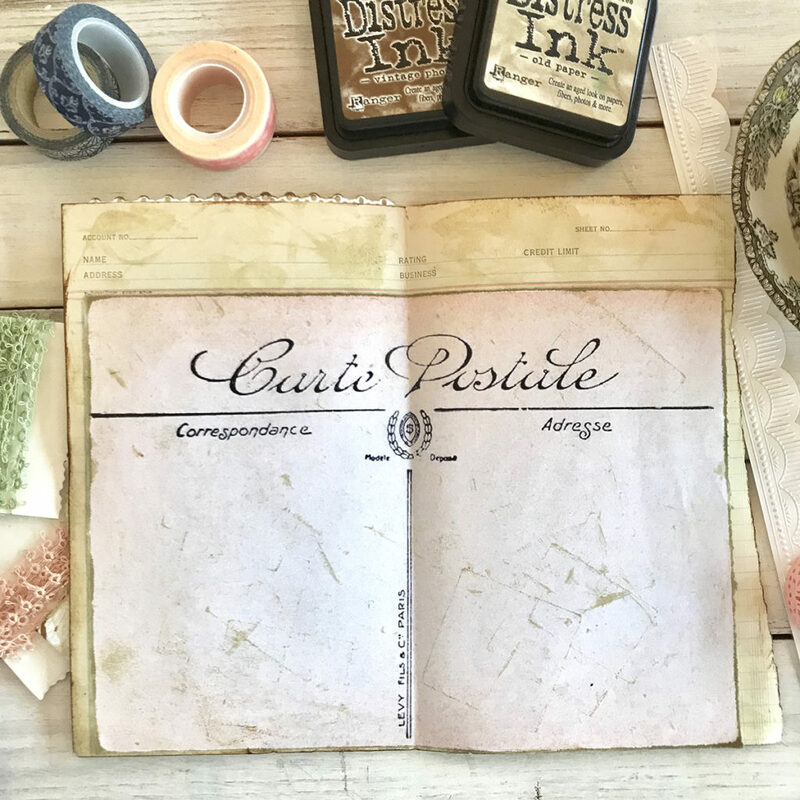 I used the darker Distress Ink Vintage Photo on this paper to make it pop from the aged ledger page. TIP: To clean the stamp keep stamping in random places on the paper until the ink has disappeared. when I attached the Graduated Stepped Pocket sheet to the ledger page with tape runner, I left the top edge open to create yet another pocket. You can see the ribbons of a journaling tag peeking out of the pocket in the image below. 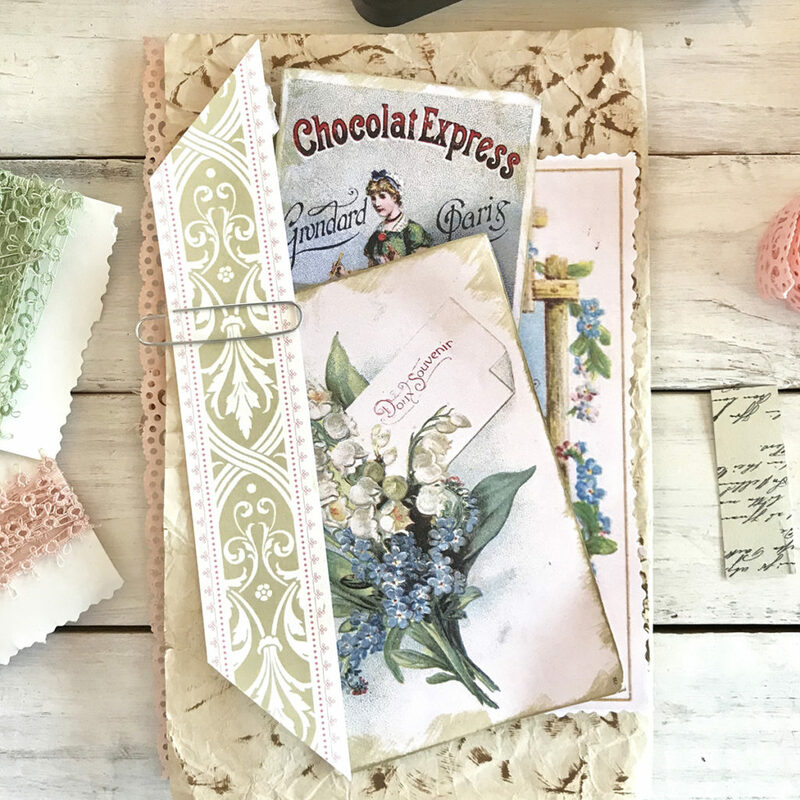 This is the large tag, made from a tea stained index card tied with antique lace ribbons. 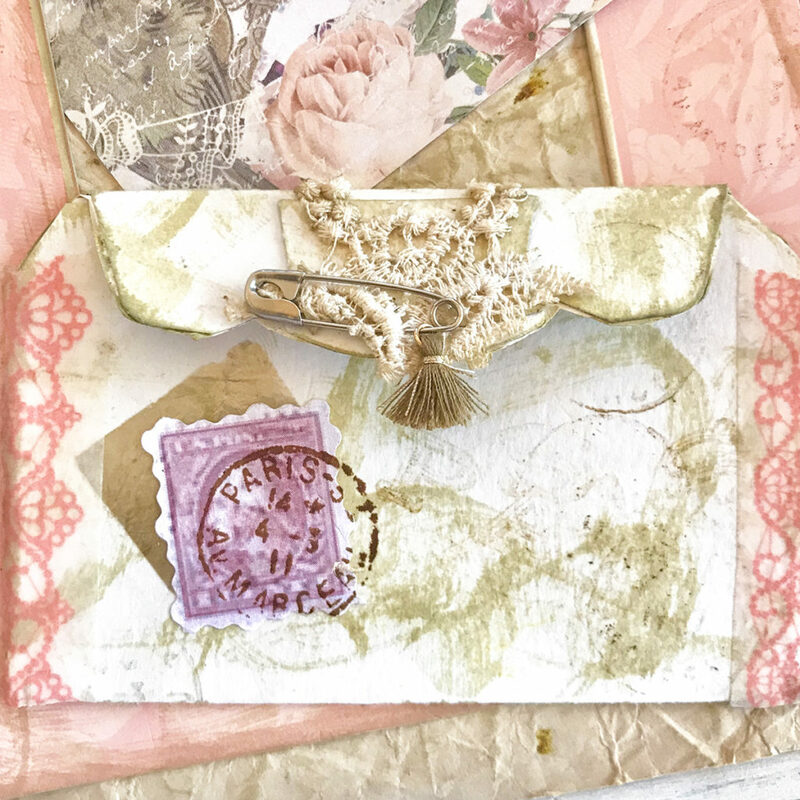 I used handmade paper with a leaf to create an envelope. I created an Envelope Template for you to use. Just cut along the cut lines and fold the edges in on dotted lines. Fold the side pieces in first. Then fold the bottom up and glue the diagonal lines. I used a tape runner. I attached the outside of the top flap to the page so it would open outward from the journal page as you can see below. Tea is my passion as you can see from most of the images. I drink a lot of tea. 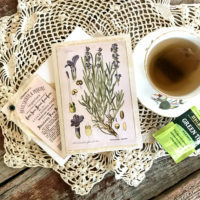 I use every bit of the packaging in my art – the tea bag paper, the string, the foil packets, the tag, and even the tea itself. 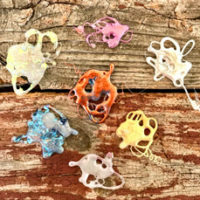 I mix it with mediums to create texture on my mixed media work. I will share that technique in a future tutorial, I promise. I love the little scalloped edge of the flap courtesy of Bigelow Tea. A Bigelow tea box has perfectly shaped sections to create two types of envelopes, and a few tags. Today I am using the top and back side of the box. The inside of the box is white, so I drag my ink pad ever so gently over the surface to create some interest. 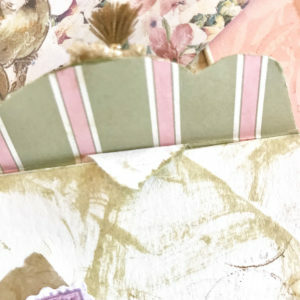 I glue scrapbook paper to the outside (colorful side) then trim using the box as a guide. This will become the inside of the envelope. 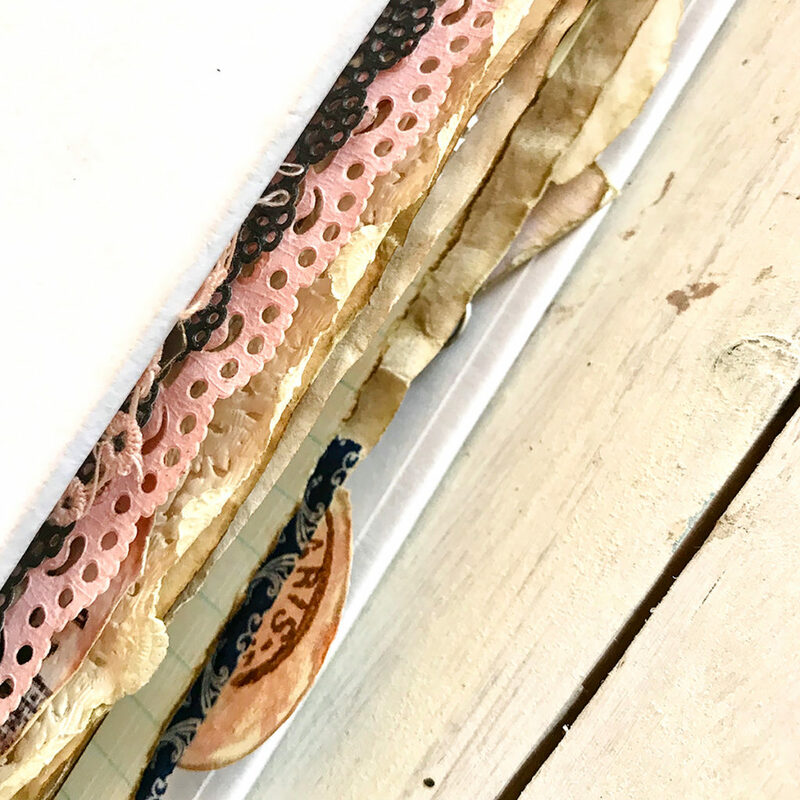 I close the edges with wide washi tape in a coordinating color and age the edges (see above), then add a bit of lace and a tiny tassel bead to complete the look. 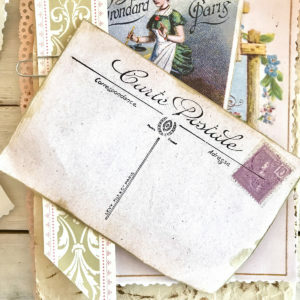 I also add a mica tile and postage stamp, then I stamp a Paris postmark from a delightful Paris stamp kit I bought several years ago. It is still available if you do a lot of French artwork!! This is a no-brainer. 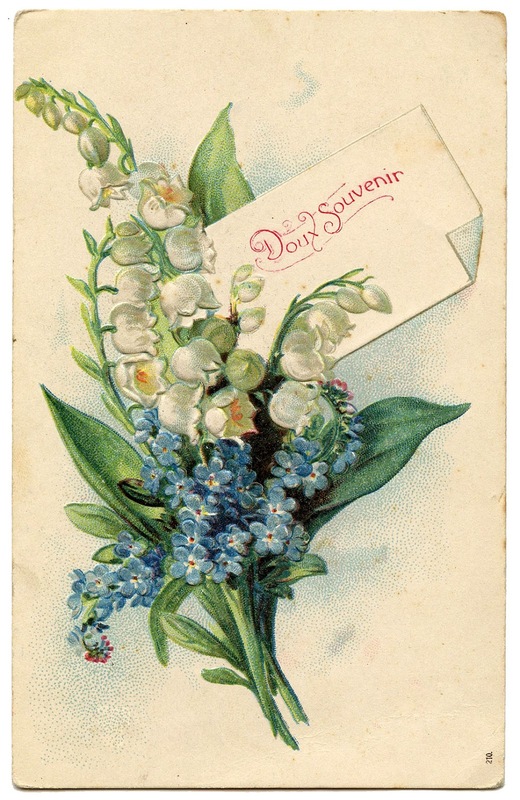 The Graphics Fairy archives has many French postcards and several ‘Carte Postale’ backs. 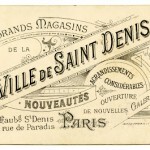 I just glue them together, et voilà – a post card! We will be doing this several times during this journey. PAGE 1 – I must apologize for not doing this signature in order. I completely forgot to make a cover page in the first tutorial. DUH!!! Olivia has her beautiful antique map and delightsome expectations as she boards the steam ship. 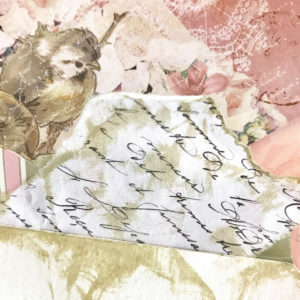 This page is essentially cut and paste of items from my stash – a remnant of scrapbook paper, pink and black lace edging, typography created in Photoshop, pink lace antique ribbon attached with a safety pin, and a little butterfly to give it a pop of color. PAGE 2 – Olivia took the time to create a little travel journal before she left on her journey. 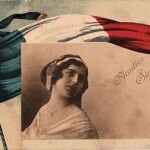 She kept a receipt (with French writing) and found this souvenir postcard on board. How fun! 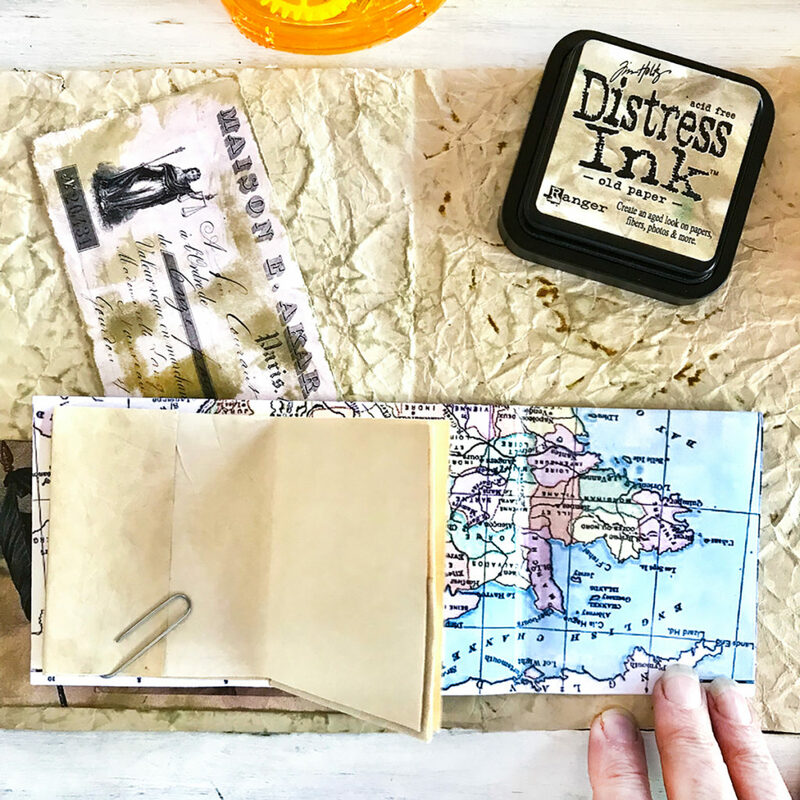 The postcard is the perfect size to make a pocket to hold the travel journal neatly in place. 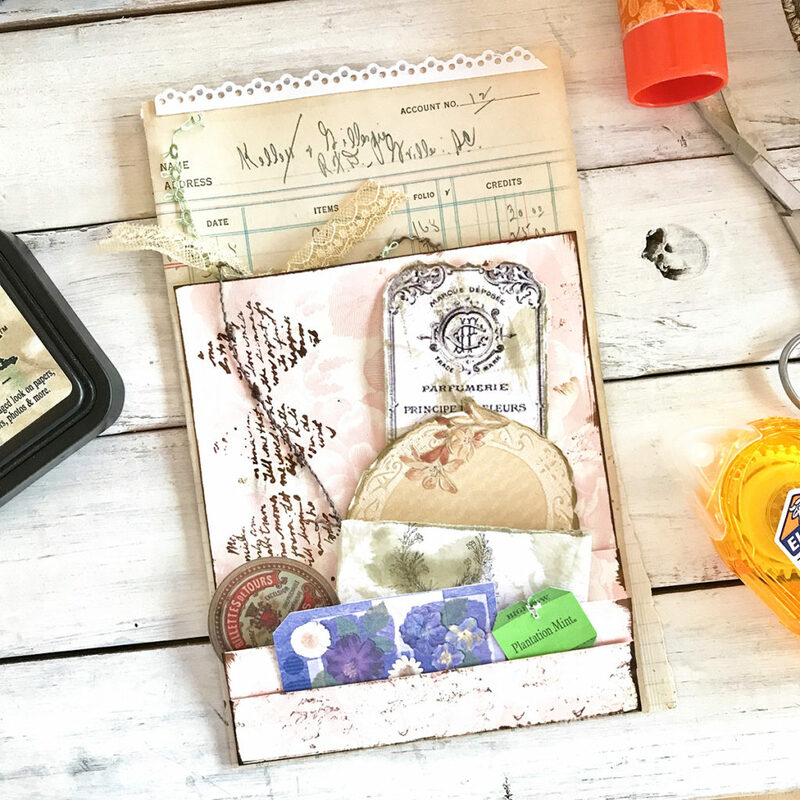 PAGE 7 – Our traveler, Olivia, has a propensity to save tiny bits of paper from the ship – a tea bag tag, a corner of a card, a floral paper that covered her drink glass, a round sticker, a perfume label, and a little oval card for journaling. This Graduated Stepped Pocket folder keeps them neatly in place. PAGE 8 & 9 – The center spread of this signature was created with an oversized Carte Postale folder that held postcards in her hotel desk. The pages are from an old ledger book that have been aged with tea stain and Distress Inks. It is glued along the bottom and sides leaving the top open, which will form two pockets when bound. These pockets will be the perfect place to hide some special souvenir postcards from the trip! The large areas are left blank for journaling. NOTE: We will be coming back to add type and bits to some of the pages in our final tutorials in this series. I also want you to use your imagination in some places. This spread would be one of those times. Use what you have and create the center spread however you like. Go ahead. Or you can leave it like mine. No pressure ever! 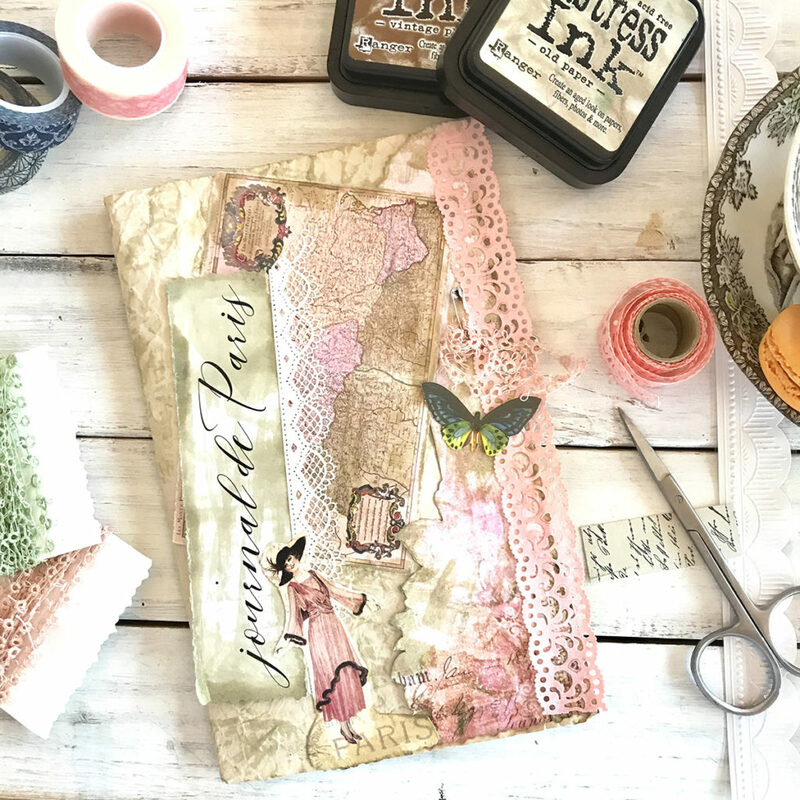 The envelope holds a card from Ville de Saint Denis, which opens to find a tea stained index card secured by washi tape…perfect for journaling about the little birds. 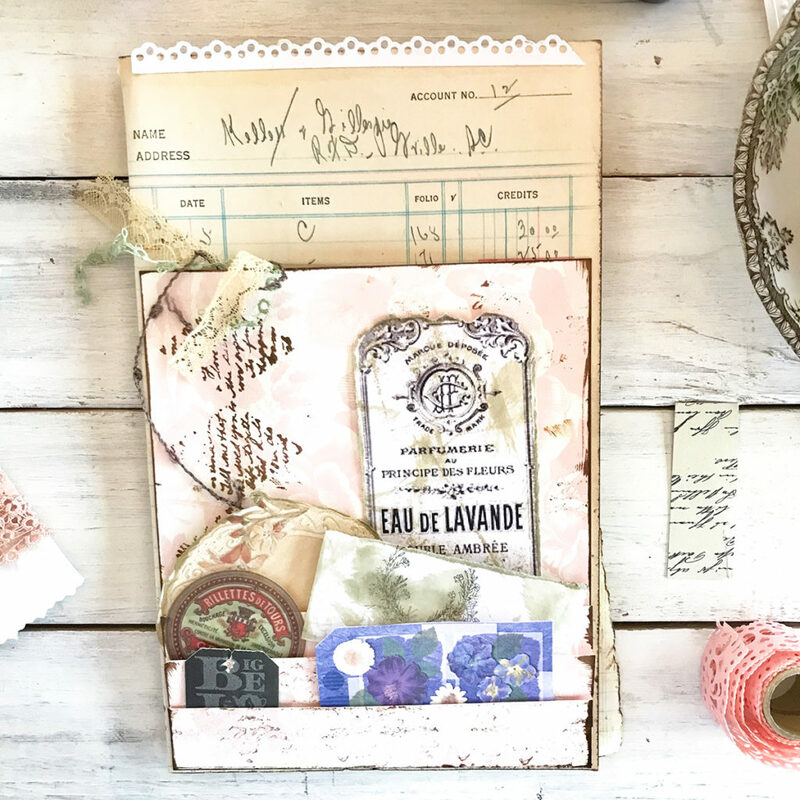 The Tea Box Envelope holds a handwritten love note that she received from a secret French admirer. When you open the envelope, you see just a tiny piece of the love note turned over the edge. If you pull it, out comes a fragment of the sweet note. PAGE 16 – Olivia has developed a fondness for French chocolates. 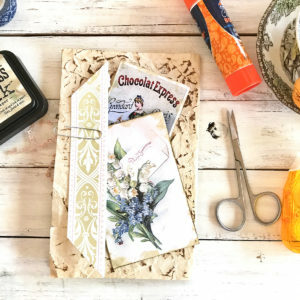 She saved labels from her two favorite boxes along with the lily of the valley postcard and a bit of trim from a chocolate box held by a large paper clip. 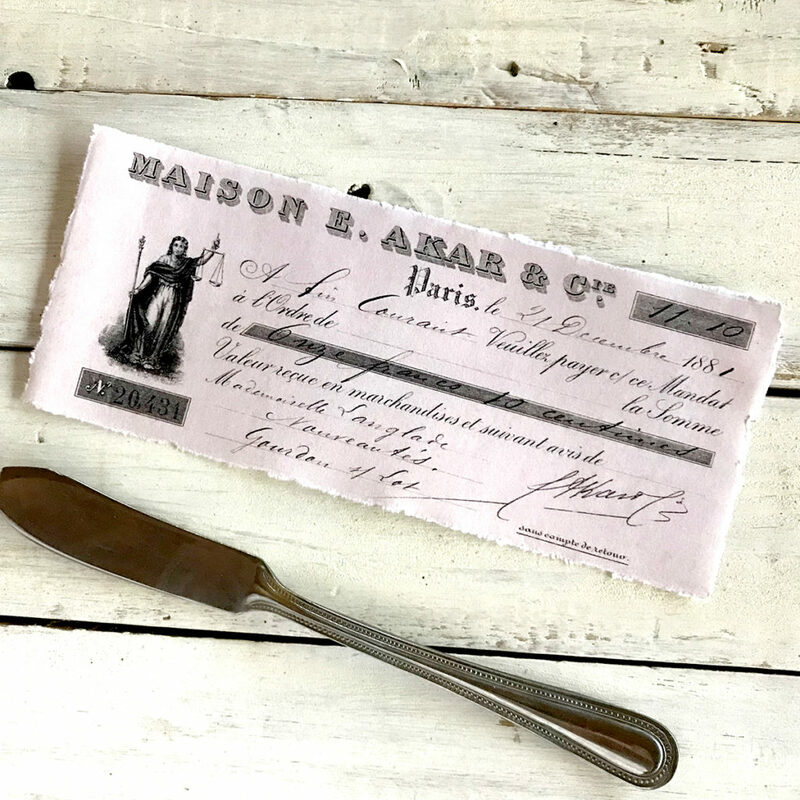 The page was aged with the technique from Page layout 1. 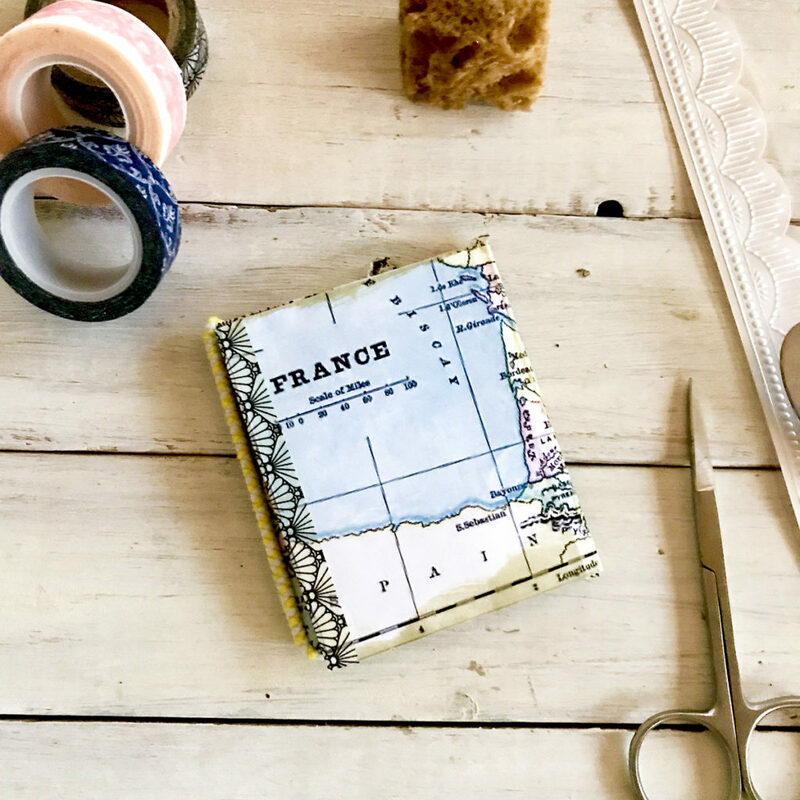 I hope you are enjoying the techniques, tips, and tricks to create your oh so French travel junk journal. Again, it should take just a few hours to complete the pages, depending on how fast you are. 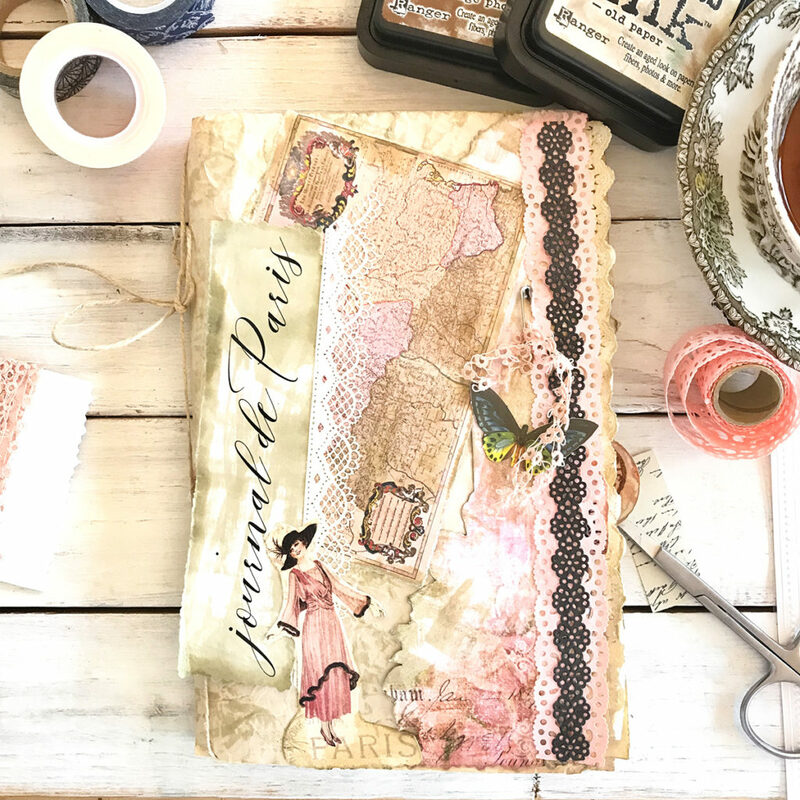 🙂 We have two weeks until our Pages Layout 3 tutorial goes live, so you have plenty of time to complete your Junk Journal Page Layouts. I hope you learned some new tricks and are ready to get creative with us this Summer. Here is your assignment. Complete eight more pages in your first signature using the above techniques. You can create your own using your imagination and any images you like. Or you can duplicate mine. Remember there is NO ONE WAY or RIGHT WAY!!! Just enjoy the creative process and you journey…wherever it leads you. Optional: Create your own story about your pages if you so desire. I can’t wait to hear your stories! 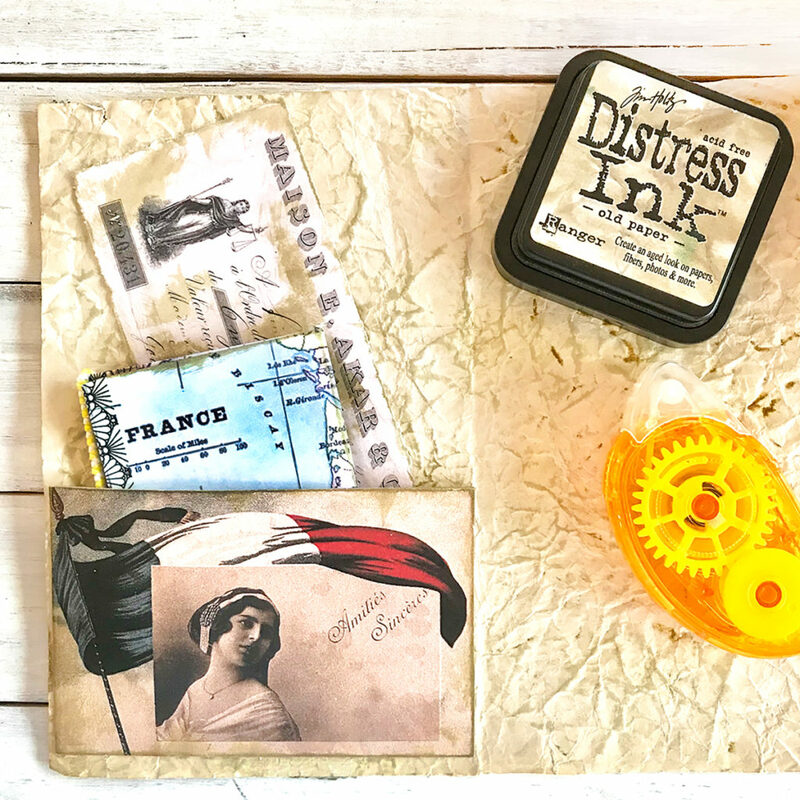 In the next tutorial we will be mark-making, stenciling, machine sewing, hand stitching, and other processes as we move out into the streets of Paris for some tourist fun with our second signature. Please join me in the next part of this series for Page Layouts Three HERE. 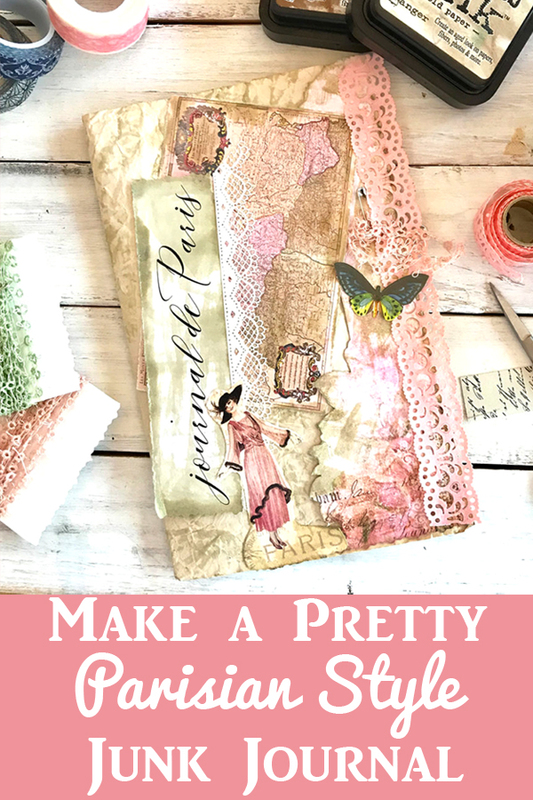 I hope you are enjoying this How to Make a Junk Journal Series. 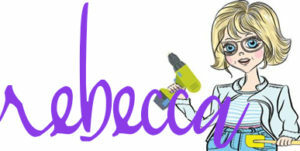 I also teach Photoshop Elements tutorials over on The Graphics Fairy Premium Membership site. You can find even more of my art, DIYs, and whimsical shenanigans on Cre8tive Compass Magazine, Cre8tiva (just launched), and loads of my digital art on Instagram. And stay tuned for more Junk Journal goodness coming your way soon, as our series continues. I’m trying to play catch up on my journal.. 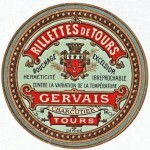 I don’t see the oversized Carte Postale image that fits across the 8 & 9 page spread… Could you tell where to find this? 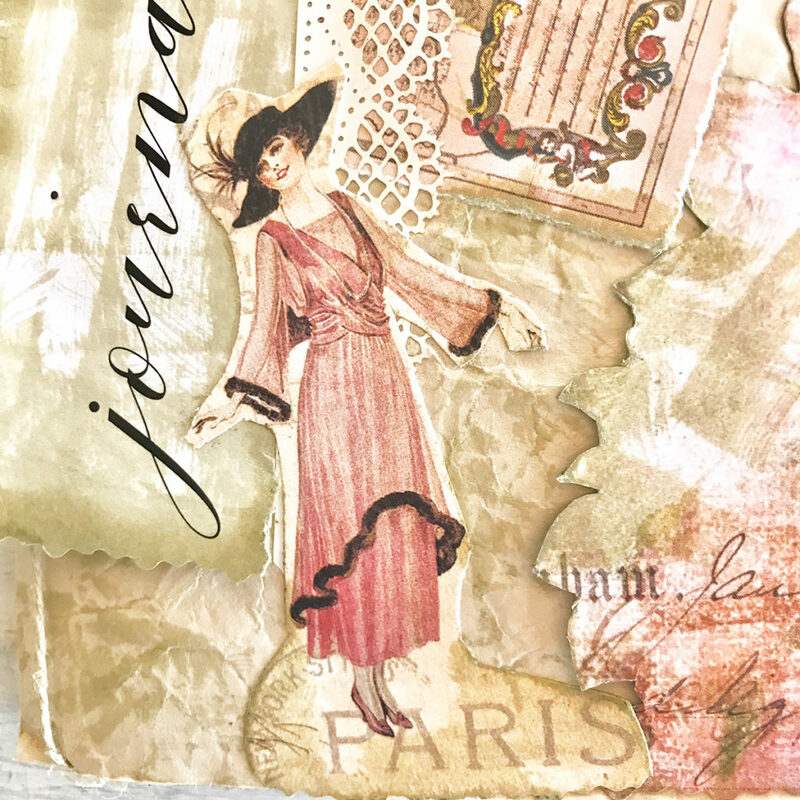 Thanks so much for sharing this class, I’m having so much fun creating this Paris travel journal! 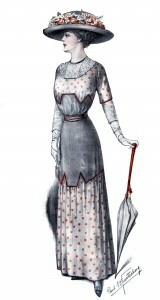 Here you are Kim, https://thegraphicsfairy.com/antique-french-graphic/ Have fun!! 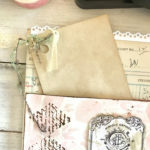 I have read all three tutorials for creating a junk journal. Did I miss how to create the front and back covers? Will there be more tutorials to come? 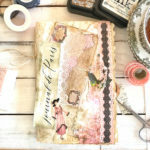 anks Kelly, all of the journal tutorials are on the blog, here is a direct link, https://thegraphicsfairy.com/ have fun! Welcome Ruth, we are so glad you found us!